I lived on my parent’s horse and cattle ranch in the Gallinas Canyon near Las Vegas, New Mexico. School was an hour’s drive down a mountain road that wound along the Gallinas River, its rapids sometimes hundreds of feet below. Judy, Nynette and Cathy beside a cabin in the Gallinas Canyon, 1956. For a few precious weeks in the summer, I had friends. I had horses to share with Cathy from Chicago and Nynette from San Angelo, Texas, whose families had vacation homes in the canyon. 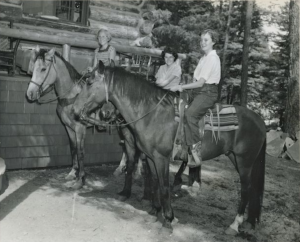 Even when we were only twelve and thirteen, the three of us rode for hours through the Ponderosa woods and grassy valleys near the ranch. We stopped to explore the adobe ruins of abandoned farms. We saw deer, wild turkey, and bear. But Nynette’s Great Aunt and Uncle insisted that we spend some time at their cabin ten miles up the canyon from our ranch. At first, we balked. We would miss horseback riding! The specter of “nothing to do” was soon banished by lively Aunt Nyne and Uncle Bill Taylor and our play in the pristine Gallinas down the slope of the hillside. One evening, we spread our sleeping bags on the porch. The cool night glowed with the Milky Way. We had to look almost directly overhead to see the stars. The stream where we had played flowed through the mountains with just enough room in its canyon for the creek’s rapids and the road beside it. We were just getting drowsy when Uncle Bill sat in the wicker rocker beside us. The light from the living room was just enough for us see his face. Uncle Bill lit his pipe. “Do you know why the campground up the road is called ‘Bride’s Camp?’” We didn’t. The old man’s eyes met ours. He cleared his throat. He pointed across to the opposite canyon wall. His finger trembled. Our eyes widened as we struggled to see through the gathering mist. A scuffle ended our stunned silence as the three of us wrenched our frozen gaze from the site of the drifting ghost. We dragged our sleeping bags into the house for therest of the night. I’m not sure we slept even then. In the 1950’s and 1960’s, Judy Beil Vaughan lived with her parents, Wallace and Elizabeth Beil, on a horse ranch located near the village of Gallinas . She is writing her memoirs Adolescent From Shangri-La about her coming of age. She lives in Elk Grove, California, which is not as beautiful as the Gallinas Canyon.